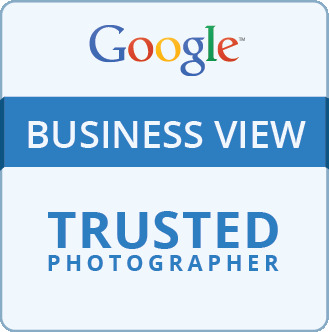 What Are Google Business View? Google Business View is a Google designed & engineered tool that utilizes their Famous Street View Technology to create High Definition, 360-Degree, Realistic Virtual Tours of the interiors of businesses. Commonly referred to as, Google "See Inside" View, Google Business Photos, Google Interior View, Google 360, Google Virtual Tours, or Google Panoramas, this technology creates a walk-through experience for the viewer that will virtually teleport them (kind of) from wherever they are, to a familiar place or to a business they haven't explored, yet. It's kind of like a first person video game... where are our Avatars, Google? Getting a Google "See Inside" View for your business is quite simple. You Are Here Photography consists of the first Google Trusted Photographers in the state and with close to 300 businesses under our belt, our Google Trusted Team brings experience, professionalism, and the best prices in the market to the table, every time. Explore Several Of Our Indiana Google Tours. See Your Google Tour On Google Within 7 Business Days, Guaranteed. With Google Business View ("See Inside"), your virtual tour can reach a global audience. Not only is it embedded on Google Search Results, Google Plus Local Pages, & Google Maps, but you can even easily embed the tour on your own website and social media pages. How will Google Business View help your business? People don't like to read heavy content about your business and sometimes, still photos just aren't enough anymore. We want more. We want to know exactly what we're getting without having to read about it. We want to experience and explore a business before dishing out our hard earned cash. Google Business View is an inexpensive way to make the decision making process for a consumer a whole lot easier. Tours Go Live Within Days! At You Are Here Photography, our prices stay competitive and start at only a few hundred dollars. Our Google Tours are priced according to how many photos we will need to take, to complete your tour. The cost also depends on your business and what areas you would like to show. Other factors include; time of day, weekend request, staging, location, layout, etc. There are no annoying monthly, annual, subscription, or maintenance fees. Trust us, this will be your best investment of the year. Get a Google Virtual Tour, today! New Google Business View Video. Watch How Business Owners Have Benefited From Google's New See Inside View. Attract them, engage them, and invite them INSIDE.